The Stratford-upon-Avon & Moreton-in-Marsh Railway was a horse worked line which was built as an extension to the Midlands canal system. 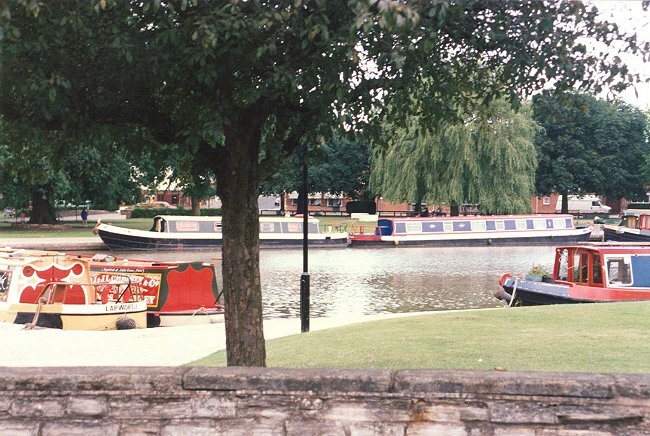 It began at the once extensive canal basin at Stratford and headed for Shipston-on-Stour and Moreton-in-Marsh. Plans to take the line on to London never came to fruition. A preserved wagon stands on the old formation near what remains of the canal basin. A short distance away is the magnificent multi-arch bridge which took the line across the River Avon. Today this is a footpath. Once south of the river the formation is carried on an embankment. 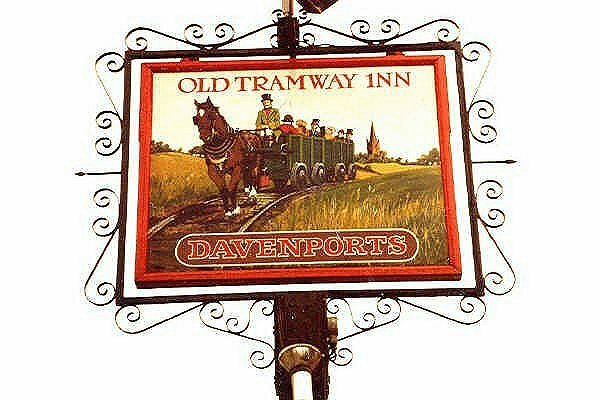 There is a footpath from the line to the adjacent Old Tramway Inn. Once south of the river the formation is carried on an embankment. There is a footpath from the route of the former line to the adjacent Old Tramway Inn. Photograph taken in 1984. 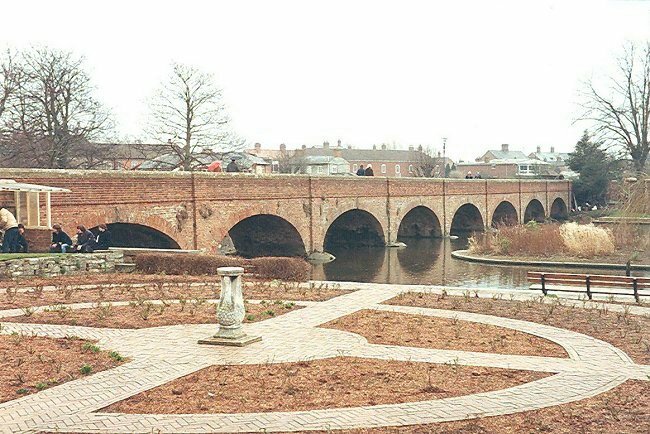 The largest remaining item from this former horse-drawn railway is the multi-arch bridge over the River Avon. Photograph dated 11th March 1984. 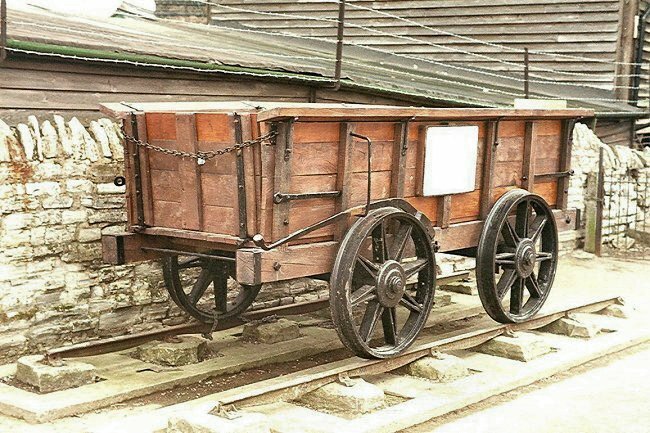 One of the most tangible relics of the former railway is this preserved wagon which stands on a preserved section of track near the Toll House at Stratford on Avon. 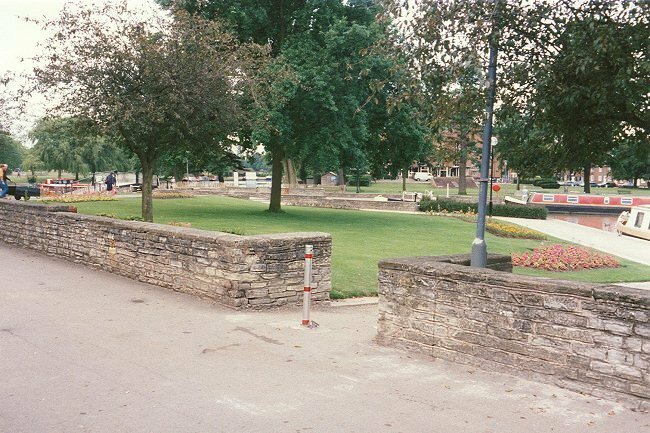 The rails are supported on two lines of stone blocks, which offered the horse an unobstructed path to walk along. 11th March 1984. 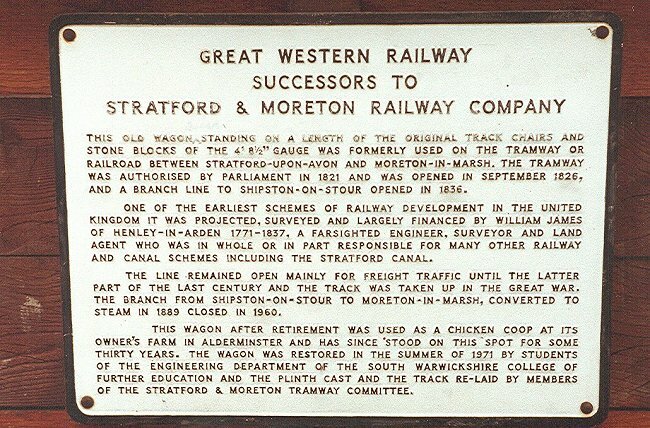 This plaque is fixed to the side sheet of the preserved Stratford & Moreton Railway wagon. 11th March 1984. 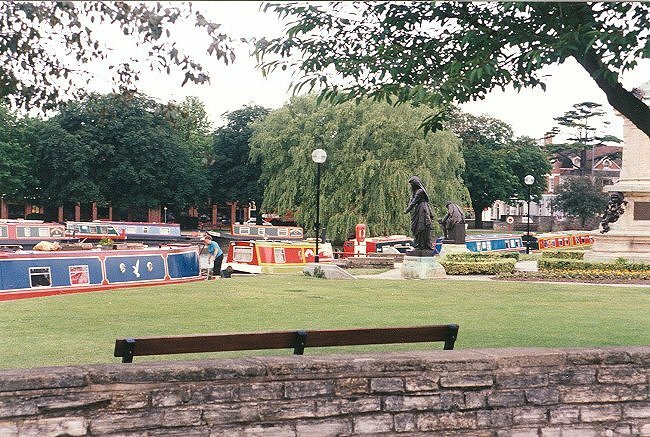 The Stratford & Moreton Railway began at the canal basin at Stratford, which today is a pleasant garden but was once a busy industrial site. This photograph was taken from the former trackbed of the main line. 22nd June 1988. The canal basin area. At one time this scene would have been a busy place full of railway sidings where goods wagons were loaded from canal barges, and vice versa. 22nd June 1988. 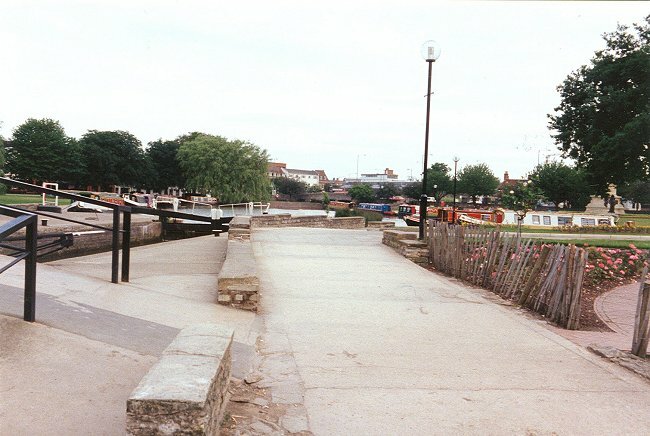 This photograph shows the river at the mouth of the canal basin. It was taken from the former trackbed of the Stratford & Moreton Railway. 22nd June 1988. The lock linking the River Avon to the canal basin. 22nd June 1988. 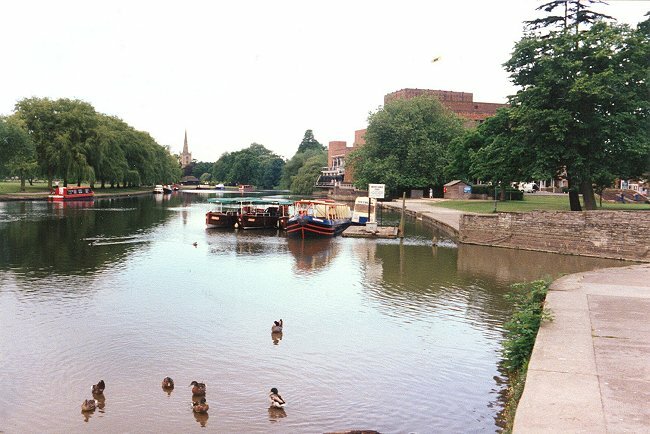 This view was taken from the Stratford & Moreton Railway bridge over the River Avon 22nd June 1988. The large building on the right behind the trees is the Shakespeare Memorial Theatre, built in 1932 to replace one destroyed by fire in 1926. In the right foreground is the entrance to the canal basin, which was where Stratford & Moreton Railway wagons were loaded and unloaded.